The Problem: Almost 100% of software programs contain "memory leaks". Over time these leaks cause less and less memory to be available on your PC. The Solution: A high-performance memory manager than can recover memory leaks and restore performance and computer reliability. 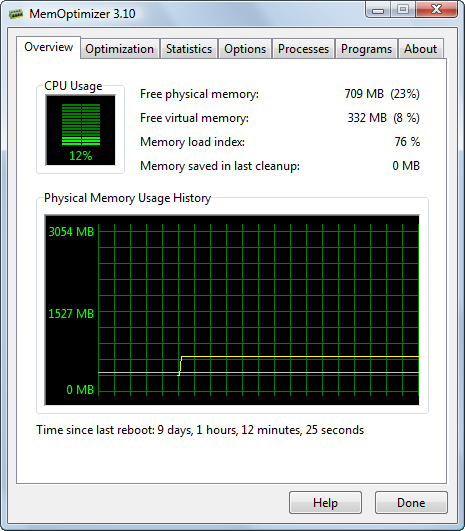 Whenever a Windows based program is running, it's consuming memory resources - unfortunately many Windows programs do not "clean up" after themselves and often leave valuable memory "locked", preventing other programs from taking advantage of it and slowing your computer's performance! In addition, memory is often locked in pages so if your program needed 100 bytes of memory, it's actually locking up 2,048 bytes (a page of memory)! Until now, The only way to free up this "locked" memory was to reboot your computer. Not anymore, with MemOptimizer™! MemOptimizer fully supports Windows 10, 8, 7 and Vista. It provides its benefits with as little as 512M of memory and as much a 32768M of memory! While no software can benefit every computer in every circumstance, we're confident that MemOptimizer will provide an increase in performance that you can feel, and it will do it when you need it most! "I installed this last night and didnt know how to use it. This morning it has already saved me 73MB"
"Hey it work great for me. Speeded up my XP in no time. Prevented crashes as far as I can tell. Like I said great!"